Crime Stoppers Guelph Wellington Program Coordinator Sarah Bowers-Peter is presented the five Crime Stoppers International Awards by Canadian Crime Stoppers President Dave Forster. The awards were accepted by Mr. Forster on behalf of CSGW at the annual conference, held this year in The Hague, Netherlands. CSGW received more awards than any other program at the conference. 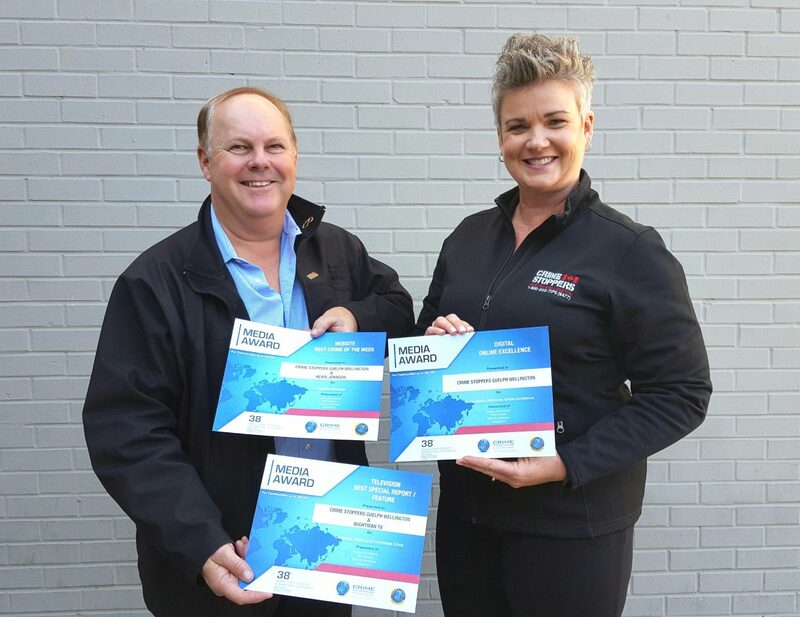 Crime Stoppers Guelph Wellington (CSGW) was honored for a second year in a row with a record of five Crime Stoppers International Awards at the 2018 Conference, October 28-31. The awards, all in the Under 300,000 population category included, Best Special Report/Feature with TV Cogeco for a two-part episode of Parenting With Barbara, Best Special Report/Feature with The Grand at 101’s Swap Talk, Best Website for www.csgw.tips and its “breadth and diversity of content”, Best Digital Platforms: Other for creative local content on social media platforms – Facebook, Twitter, Instagram, and Youtube, and Special Project for a Program “It Takes A Village – Crimes Against Youth”. The awards were presented in The Hague, Netherlands and were received on behalf of CSGW by Canadian Crime Stoppers President David Forster. “(CSGW) was the recipient of five Awards judged by an independent panel from submissions from 26 countries around the world. Each nomination was critiqued based on a specific set of criteria and compared with similar population groups worldwide,” said Forster. “We are extremely happy, and proud, that CSGW has been recognized by Crime Stoppers International with these awards, but more importantly, we are happy that the communities we partner with share in these accomplishments,” stated Deryck West, Vice-Chair of the CSGW Board of Directors. CSGW received the most awards of any program at the conference in 2018, upping the total from three last year. These awards mirror the awards presented at the provincial level in June. 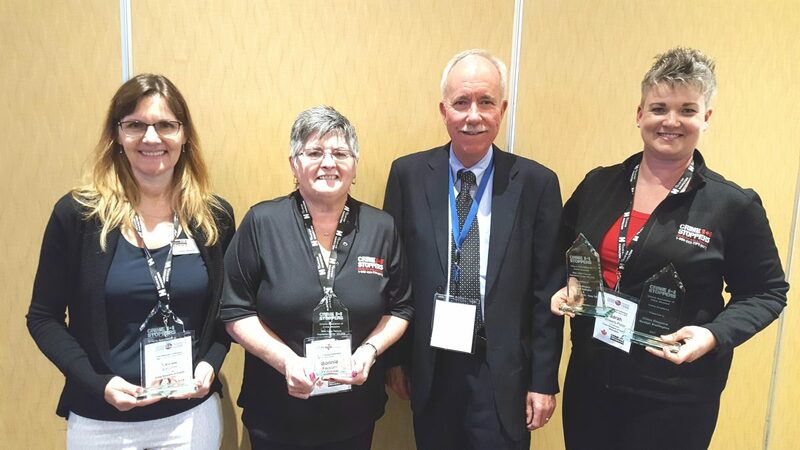 Crime Stoppers Guelph Wellington (CSGW) has once again earned provincial recognition, this time bringing home five awards from the 2018 Ontario Association of Crime Stoppers Conference (OACS) held in Hamilton, May 31-June 3. The first award was Special Project for a Program with a Population Under 300,000. This was presented to CSGW for “It Takes A Village – Crimes Against Youth” which was held at Centre Wellington District High School in November 2017. The event, hosted by CSGW, tackled the topics of human trafficking and cyber safety, and included community partners such as Wellington County OPP, Guelph Police Service and Victim Services Wellington. This is the first time CSGW has received this award. Online Excellence, was the next award, which incorporates social media awareness as well as website design and use. 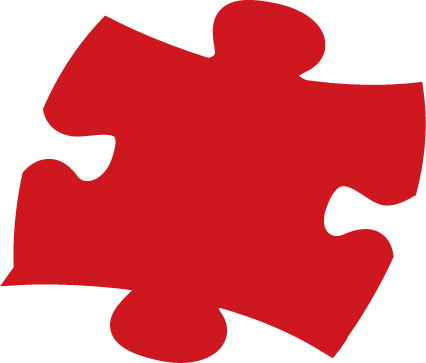 This category is open to all programs, regardless of size. CSGW is active on Facebook, Twitter, Instagram, YouTube and its website, www.csgw.tips. It is the second year in a row CSGW has received this award. Best Radio Feature for a Program with a Population under 300,000 was the next honor. This award is shared with The Grand at 101 out of Fergus, and was a submission from Swap Talk with Rob Dutton and McKim Ecclestone featuring Program Coordinator Sarah Bowers-Peter. In this episode listeners were able to submit questions about Crime Stoppers. It is the third time in a row that CSGW has received this award. The fourth award was presented for Best Video Feature for a Program with a Population Under 300,000 in conjunction with Cogeco – Your TV out of Fergus. Crime Stoppers was featured in a comprehensive two-part series of Parenting With Barbara with host Barbara Evoy. Each of these awards was presented by Don Hawkins, President of OACS, during Friday’s awards ceremony. For the third year in a row, CSGW received the Marla Moon Memorial Award of Excellence for a Program with a Population under 300,000. The winner of this award is the program that best demonstrates commitment to the Crime Stoppers mission through its basic responsibilities, such as taking and processing tips, and its efforts at community outreach and partnership. This award was particularly special for CSGW as it was presented by Crime Stoppers founder Greg MacAleese during the Saturday evening Gala awards ceremony. 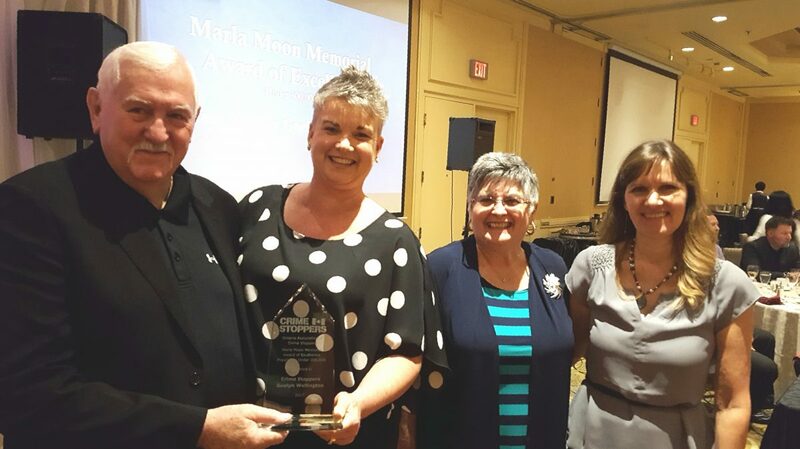 Greg MacAleese, left, who developed Crime Stoppers in 1976, presents the Marla Moon Memorial Award of Excellence (Population Under 300,000) to CSGW Program Coordinator Sarah Bowers-Peter, CSGW Treasurer Bonnie Facklam and CSGW Office Coordinator Leesa Keleher. It is the third year in a row CSGW has won this award. Dave Forster, President of Canadian Crime Stoppers Association, presents the three Crime Stoppers International Awards to CSGW Program Coordinator Sarah Bowers-Peter. The awards were presented at the International Conference held in Panama City, Panama. 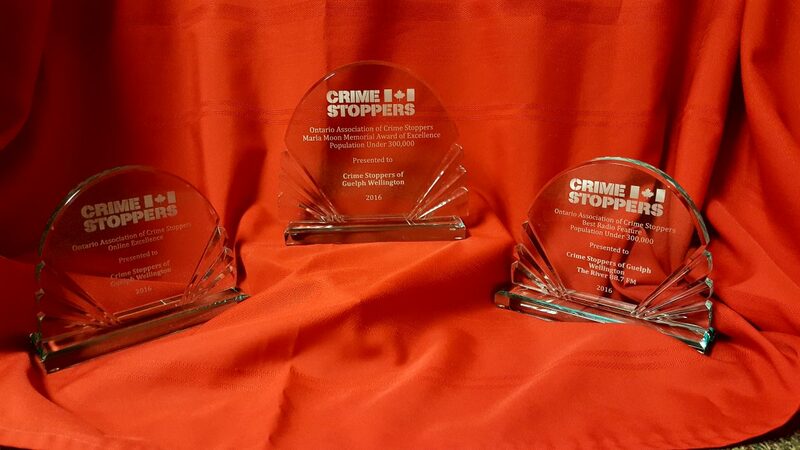 For the first time in Crime Stoppers Guelph Wellington (CSGW) history, the program received three Crime Stoppers International Awards. The awards were announced in Panama City, Panama, and were accepted by Canadian Crime Stoppers President Dave Forster, on behalf of CSGW. The awards were presented in October 2017 for entries submitted for 2016. Best Special Report/Feature – Television (Population Under 300,000) – for a two-part production entitled There Is No Victimless Crime, in cooperation with Wightman TV of Clifford. Digital Online Excellence (Population Under 300,000) – for CSGW’s social media presence, including Facebook, Twitter, Instagram and YouTube. Marla Moon Memorial Award of Excellence (Population Under 300,000) â€“ this award recognizes the overall achievements of a program in the areas of tipster calls, cases cleared, rewards paid, volunteer hours, outreach in the community and partnerships with police, investigative agencies and media outlets. Marla Moon Memorial Award of Excellence (Population Under 300,000) – this award recognizes the overall achievements of a program in the areas of tipster calls, cases cleared, rewards paid, volunteer hours, outreach in the community and partnerships with police, investigative agencies and media outlets. 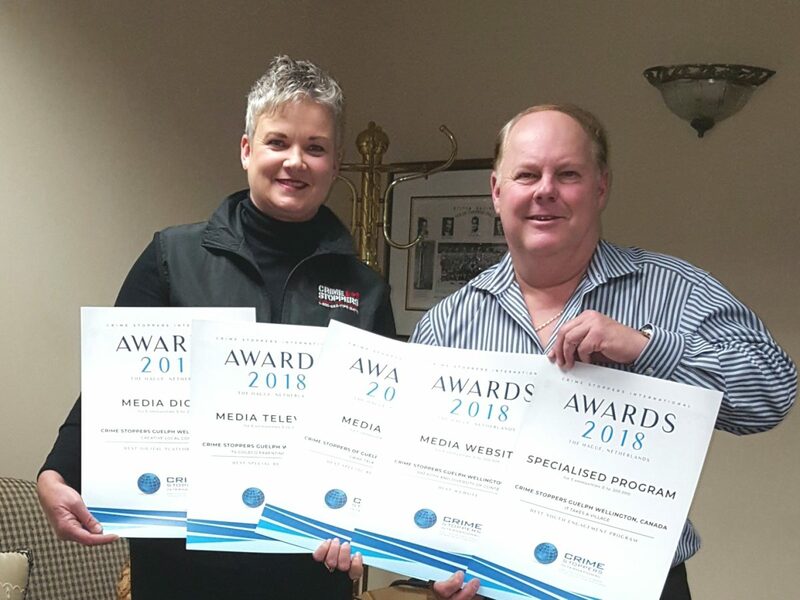 We are proud to share these awards with our volunteers, supporters and tipsters, who can rest assured they are working with one of the best programs in the province!